Awaking before dawn, I was amongst the first from our group to sit down at 6 AM for a hearty American-style breakfast of hot porridge, eggs, fruit and coffee. Considering a trek to see Rwanda's endangered mountain gorillas can take anywhere from 2-12 hours, I wanted to ensure my batteries were fully charged. Excitement soon began to outweigh our sleepiness at the table. Less than a week earlier, I was in suburban Virginia watching Gorillas in the Mist. Now, I was in the heart of Africa, about to visit these critically endangered primates in person. As we were about to get in our SUV's for the ride over to Volcanoes National Park, Kristin Luna arrived from Kigali. The last member of our group had joined us just in time to take part in the country's number one tourist draw. 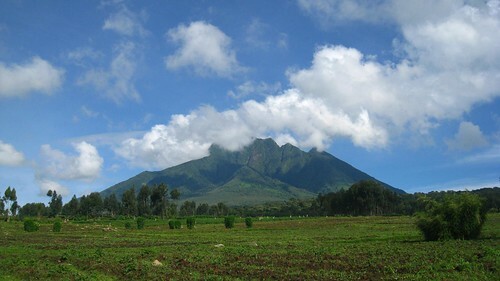 The early morning drive had us approaching the towering volcanoes that gave the park it's name. The locals were commuting by foot along the roadsides, as is commonplace throughout the country; kids welcomed us with enthusiastic waves. Despite our best efforts, we still managed to arrive late. Around the grounds of the visitor center, 6 other groups of 8 tourists each were receiving their briefings about the gorilla group they were assigned to see that day. 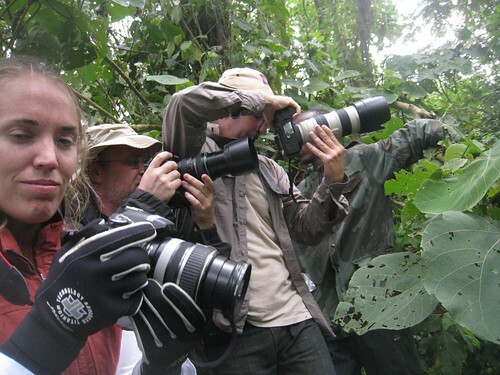 Each foreign tourist had paid $500 for their trekking permit, with the vast majority of that money used to fund the further protection of the gorillas. We quickly learned that Kwitonda, the group we were assigned to visit, which crossed into Rwanda from the Democratic Republic of Congo about 5 years ago, was hanging out at the edge of the forest. Our adventure would be over before lunch. While a protracted, bushwhacking endeavor might make for a few extra anecdotes over dinner, we weren't complaining. During the 15-minute briefing, we learned a few things about mountain gorillas, but what stuck with me most was how they can be uniquely identified by their noseprints, similar to how humans have distinct fingerprints. And then, long after all the other tour groups had departed, we were back in the SUV's, bouncing up and down rocky roads on the way to our entry point into the forest. Upon existing the vehicles, we were greeted with hand-carved wooden walking sticks, and our group's guard, who was equipped with an AK-47. The firepower was needed not for the gorillas, but in case we ran into any other large beasts, such as buffalo, we were told. The trek begin, as they so often do, by gingerly walking through farmland. I checked the altitude at the line where the fields met the forest. At 2,350 meters, it was high enough to feel your breathing become a little labored, especially if you ran ahead to capture a photo looking back. Our young female guide stopped us for a moment, before we climbed over a rock wall, to review the protocol around our approach and observance of the gorillas. The tracker would alert us about 200 meters from the group, and at that point, we'd leave everything but our cameras behind. Easier said than done for Eric and Peter, who both hired porters to carry all their gear. Before the trip, I had picked up a long sleeve, breathable undershirt from REI, along with a synthetic short sleeve shirt from Mountain Hardwear. The combination, along with my trusty, lightweight North Face pants and Merrell shoes were the perfect outfit for the environment. Soft, comfy Smartwool hiking socks completed the ensemble. I also carried a waterproof jacket in case it rained. Finally, we donned our waterskiing gloves, on loan to us from the park to protect against stinging nettles, and entered the forest. The foliage was not as dense as I imagined, however it still required one's attention to negotiate. Whether you take gardening gloves from home, or borrow ones from the park, their protection is worthwhile as it allows you to move through the forest with greater ease. If you want to take photos en route, it's best to stop for a moment, as it is easy to trip over fallen logs and tangled roots hidden beneath the brush. 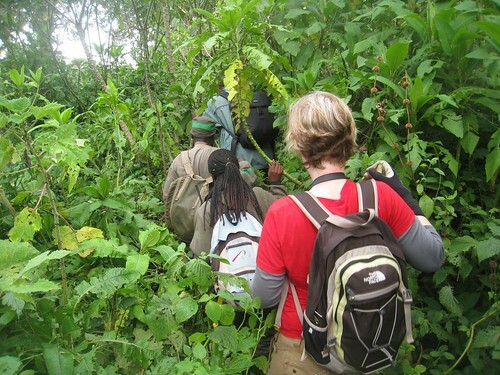 About 45 minutes into the trek, our guide said we were close; she could smell the gorillas. I sniffed the air, and noticed nothing unusual. And then Peter saw one. We know this because he went to photograph it and was called back by the guide. So much for the 200-meter warning. We left our packs with the porters. I stuffed my camera, Flip video camera, and Blackberry into a small nylon dry bag, in case it rained during the one hour we were allowed to spend with Kwitonda. I took the lead position, right behind our male guide. We passed through a thick section of foliage, and emerged into a small clearing. 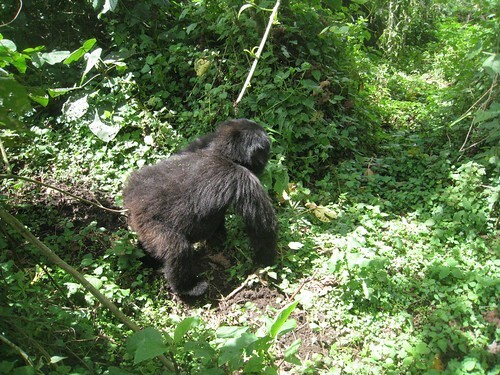 He waved us through; ahead, no more than 10 meters, was a silverback gorilla munching on plants. He didn't seem to care that we were there. Nonetheless, after a few minutes, he trotted out of sight once again. 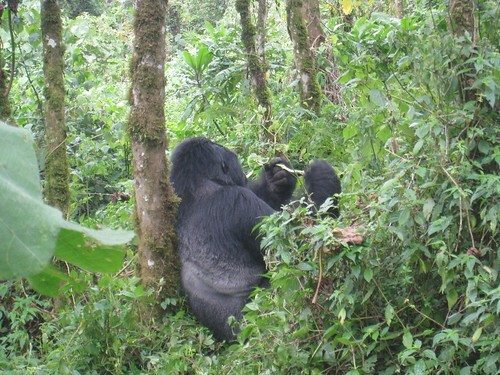 We followed the guide further, and found the silverback resting against a tree, still contently munching on plants. It was really amazing, and of course, we were all taking photographs like crazy. After another minute or two, we continued onward into a clearing where there were several more gorillas hanging out in the trees, and on the forest floor. The real treat was seeing a mama gorilla pass by us with her baby on board. As with panda bears, and all forms of cuddly wildlife, it's hard not to oooh and ahhh in such moments. The mama gorilla spent a few minutes sitting by one of the two silverbacks in the group, which gave us a sense of the size difference between the male, female, and baby. During our hour with the gorillas, the silverbacks ate, talked (our guide often interpreted for us), pounded their chest a few times (which is a way to keep warm, as well as communicate), and farted (though I didn't catch wind of that personally). To our great amusement, two or three of the adolescents were playing the whole time. Activities involved chasing one another around a thin tree trunk, knocking each other off a fallen tree, and swinging on vines. Before leaving for Rwanda, I'd seen a few photos of travelers who'd captured the gorillas in the background, so it was a shot I knew I wanted. Luckily, Ben came through with a photo that bears a striking resemblance to the infamous Crasher (aka Banff) Squirrel. Despite our small group size, we were tripping over each other to get the best angles. The official rule was to stay 7 meters from the gorillas, but to be frank, we all managed to break it during the excitement, and were probably closer to 3-5 meters away at any given time. As our time wound down, and we were being ushered away from Kwitonda, a young adolescent came traipsing down the thin path we were standing along. The guides signaled for us to move away, but without knowing where to go, a few of us got a squeeze on the leg from the rambunctious teenager. On an intellectual level, I knew it wasn't appropriate for the contact to have occurred, however in that moment that it rushed by, grabbing the cargo pocket on my left leg, I instantly knew how Dian Fossey could become so enamored with these gorillas. On an emotional, instinctual level, it felt remarkable to have experienced physical contact with such a rare animal in its natural habitat. Meanwhile, in what became known as “the moment” of the trip, Stefanie (aka Adventure Girl), having been touched by the gorilla as well, burst out that it had taken her BlackBerry. Because gorillas, despite their furry exterior, and preference for living in the remote regions of central Africa, still enjoy mobile technology just as much as the rest of us primates. 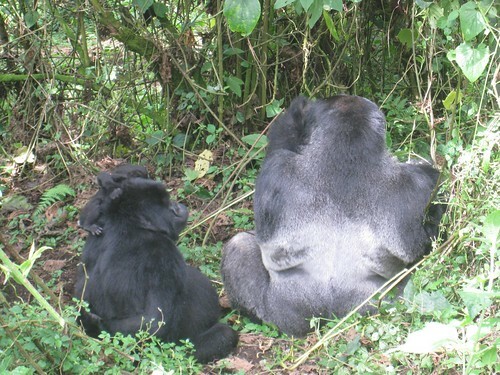 While numbers are slowly increasing, there are only about 700 mountain gorillas in existence. They can be found in northwestern Rwanda's Volcanoes National Park, southwestern Uganda's Bwindi Impenetrable Forest, and along the eastern edge of the Democratic Republic of Congo in Virunga National Park, where they remain under the greatest threat from poachers. This Thursday's photo essay will feature many more photos of these peaceful primates. Thanks for reading Phil. Much more ahead, though it’ll be a real test to try and outdo the gorillas in writing or photos. Great post with amazing pictures and video. It makes you feel that you are one with nature by seeing that close contact. Great post Dave. And, thanks for that video bit too. I had a similar experience with a lemur once. I imagine that having a gorilla touch you on its way past is even more exhilarating. What an amazing trip! Great photos. I’d love to go to Rwanda and Uganda one day to see the gorillas. 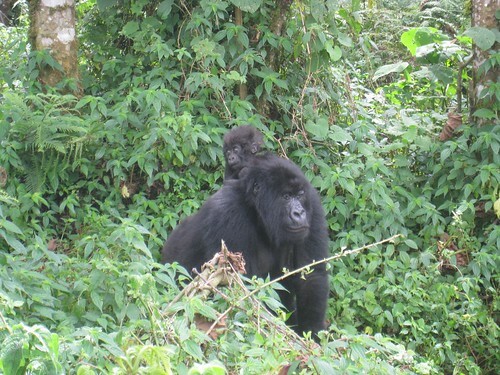 Hi Leslie, thanks for checking out my Rwanda gorilla post. It was a wonderful experience! Heyyy cool site – do you know of any way to download youtube videos for free? Please inform me it labored suitable? I dont want to sumit it once more if i will not have to! Either the web site glitced out or i am an idiot, the second choice doesnt shock me lol. thank you for a great weblog! Seems like a wonderful experience. 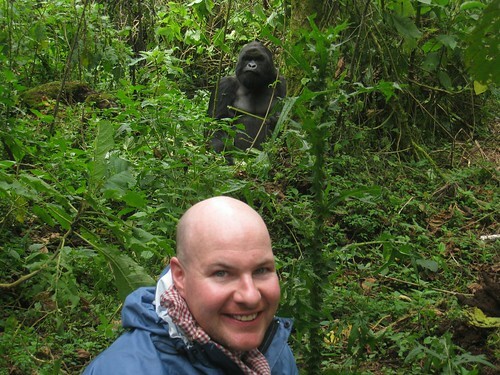 I wonder if gorilla trekking is available in other countries other than Rwanda (might take some convincing for Jack to go there)…. Jill – you can see the mountain gorillas in Uganda and Democratic Republic of Congo as well, however most people stick to Rwanda and Uganda. 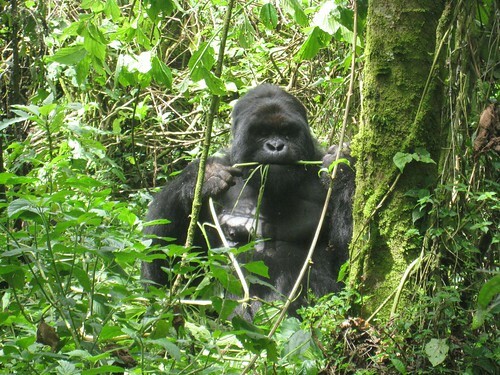 Sounds like you had an amazing gorilla trekking experince. The photos are fantastic and you got so close to the gorillas! 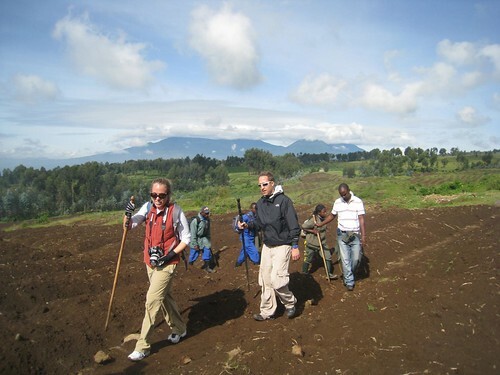 Uganda is a fantastic country to visit and explore a contrasto to wha you think of as a traditional Africa safari. The lush, fertile vegetation attracts an incredibly diverse array of wildlife. There are more gorillas in Uganda than Rwanda but the truth is that its easier to see the mountain gorillas of Rwanda than Uganda. 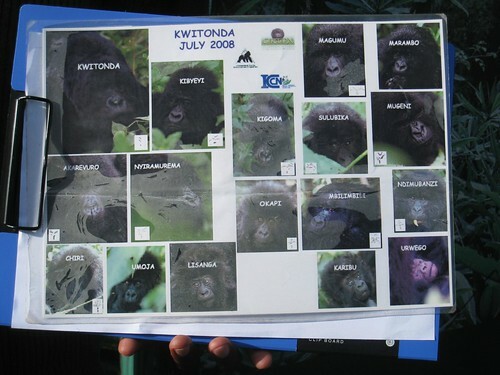 Problem is, the permit for Rwanda gorillas is $750 from the 1st of June, yet Uganda is $ 500. They’re raising the price by $250 in Rwanda? That’s a huge increase. Hey thanks for the write up. My wife and I are heading to Uganda and Rwanda for some gorilla trekking and was happy to see that my North Face pants will work just fine. You’re welcome Ted. Have a great trip!